Are you traveling or working for hours in the kitchen or just trying to escape family this week, for American Thanksgiving? Me too, so I thought this week we could take a look at the best of the past episodes. If you'd like me to keep you company during your holiday prep, you'd have plenty to listen to. These episodes will come in handy as you're wrapping up 2018 and planning for 2019. They are the most-downloaded, the most-shared, and the episodes more people tell me totally changed their business or their perspective. Today I'm going to recap my biggest and best episodes, so those of you who have just found the show know which ones to go listen to, or those of you who have been around for a while can listen again and get reinspired. If you missed these, I really recommend you listen to them, as together they form a foundation of business and life transformation. These six episodes are both the most-downloaded (each has over 2000 unique downloads) and the ones I truly love the most, which just reaffirmed for me that I should keep talking about what matters most to me, because it matters most to you too! A quick note: In some of these episodes I talk about the Starship, which was totally overhauled this year and will be open again on Dec 27th. So if you want to learn what the Starship is now and be the first to be notified when it opens again, head to taraswiger.com/starshipbiz and just remember that what you hear me say in past episodes may have changed since then! Just click on the header for each episode to find their audio, video and written transcription. In this episode I walk you through the process of not just creating a checklist for yourself, but really focusing on what you WANT in your business and your life. It's just 13 minutes, so give it a listen here. This is one of my most-asked questions: How to you get back into business after a break? 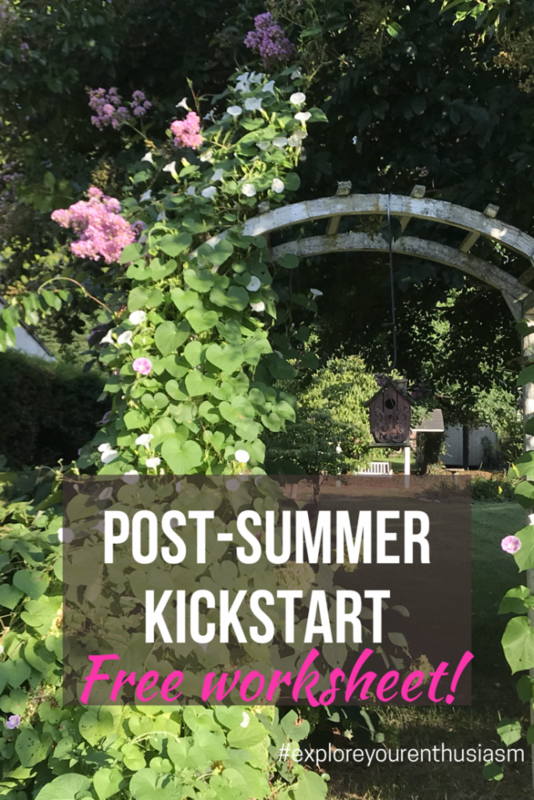 How can you make a totally fresh start after a bad year, or a bad week, or a bad review? Even if you've never met a goal before, you can start fresh TODAY, and that's what this episode walks you through. You can find it here. Here’s a dichotomy: You want to listen to your customers and your audience, to give them what they want, to create an awesome business. But yet, needing their approval has you frozen or afraid or feeling kinda needy. How do you balance this? In episode 189, I break it down for you – how to unhook from needing approval, while still listening to important feedback. This was a HUGE business lesson for me in 2017 and this episode inspired more feedback than any other episode, you can listen in here. Right in line with not seeking approval, let's get over the fear of disapproval! Are you unsure of your next step, because you’re afraid of the reaction you’re going to get? Are you avoiding rejection, because you want to have the approval and acceptance of your customers and audience? Yeah, me too. In this episode I teach you how to move beyond fear into ACTION, find it here. This was a really different episode, in it I shared the lessons from the book How Emotions are Made, by Lisa Feldmen Barrrett, PhD. It helped us understand how to keep emotions from screwing up your business or reacting rashly, by understanding how they're made. The author has done so much research on emotions and the brain and how emotions actually form. Realizing all the pieces that go into making an emotion, can help you understand how to work with your emotions. The big lesson, that emotions are “constructed, not automatic” shifted your perspective a lot, based on the feedback I got. Listen in here. This episode was written in response to a question I got from the Starship: If Stretch Goals are good, how do you know what the right amount of stretch IS? How much is too much? What is ridiculous and what is a good kind of challenging? This episode helps you figure out if YOU are the kind of person who's motivated by a crazy goal or a doable goal and then helps you set some goals from there. Find that episode here. This is the episode I refer people to most often, because we ALL struggle with what to say when someone asks us: Why does your thing cost so much? This is so so vital for the health of your business and your mental wellbeing. The more confidence you have when discussing your prices, the more sales you'll make. In this episode we talk about how you can get really confident and grounded in your prices, so you can share with confidence and make more sales. Listen to it here. 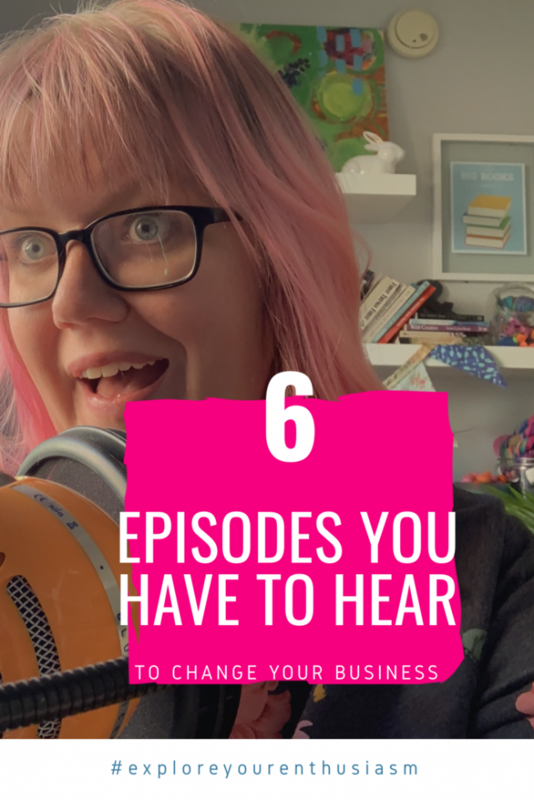 So there you go – the Top 6 episodes of the podcast, and the ones that will help you transform your business and your life in the coming year! Can't wait to listen to the best of #ExploreYourEnthusiasm! I'm getting reinspired already! What if I’m not good enough? What if they call me a fraud? What if everyone figures out I don’t know what I’m doing? Hello, this is Imposter Syndrome and girl, we all deal with this all the time. So in this week’s episode we’re going to look at what it is, what it means, and how the heck to move past it. Guess what? I’m 233 episodes and 4 years into this podcast and I still worry I’m not good enough. I got a bad review earlier in the week I’m recording this, my first ever, and I thought: Yes, they’re right, I’m not good enough. Thankfully I thought through how I’d talk to a client about this and I realized, “Wait, hold up! 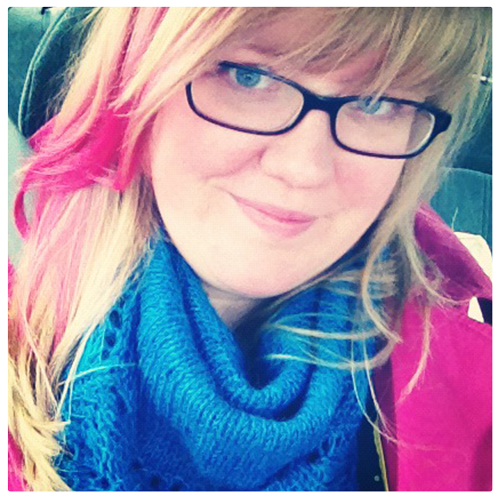 This is imposter syndrome.” I hopped on Instagram and sure enough, you all feel this all the time. In fact, I did a little question pop-up on my Stories and got more responses to this than anything else I’ve ever asked. You guys told me you wanted to know: What the heck is it? Does it mean anything? And above all: What can we do to get over it? What does it mean when you feel it? It means your human. That you are challenging yourself to do things beyond what you used to do, so you worry you’re not good enough, because you haven’t “proved” it to yourself and others yet. Or you have proved it and you’re just not giving yourself credit for it. In other means, it doesn’t mean you should stop. It is not a “sign”. How do you get rid of imposter syndrome? How do you deal with it? First, you have to recognize it for what it is. This step alone can dramatically change the impact Imposter Syndrome has on you. Because by naming it, you realize it’s a way of thinking (that is very common!) and not FACT. How can you start recognizing it? Notice when you are backing away from something or stressing about something. Ask yourself – why am I afraid right now? What am I afraid others will say? Then, say to yourself: It’s ok to feel this way, it’s ok to be afraid, I can do it anyway. Failing because you’re not good enough. In other words, it’s not necessarily true that you will be “found out’ or that you aren’t “good enough”, you are just afraid that you’re not good enough. There is a big gap between being actually bad at something and being judged to be bad at something. Good news: JUST naming it can help reduce the effect of Imposter Syndrome! An estimated 70% of people experience these impostor feelings at some point in their lives, according to an article published in the International Journal of Behavioral Science. So seriously, you are NOT alone. In other words – recognize the feelings and realizing you’re not alone helps eliminate the feelings! Do you minimize the value of what you’re great at? Yeah, most of us do, because it comes easily to us, we think it doesn’t matter. But it does. And if you devalue what you’re good at, you’re going to think you’re not worth much. Start keeping a list of what you’re good at, what others compliment you for. List all of the times you were new at something and succeeded. List times you failed, but were fine anyhow. Researcher Queena Hoang found that moving your reasons for doing something from external motivation to internal motivation, lessened the Imposter Syndrome. She published her results in the paper The Impostor Phenomenon: Overcoming Internalized Barriers and Recognizing Achievements. What does that mean? Change your reasons from “I have to do this” (external) to “I want to do this for me” (internal). In fact, it’s this last one that helped me overcome my recent flash of Imposterism. I realized that if I let reviewers who don’t like my voice silence me, then I am telling all of you, the world at large that you should be silenced if people don't like you. Which is pretty much the opposite of what I believe. I believe everyone (and women and communities who have traditionally been silenced) should share their voice, their art, their expression, whether others approve of it or not. That we should not be silenced by the critics. So next time Imposter Syndrome rears its head, look at what listening to it will communicate to your children, your friends, the world at large. Will you send the message that you have to be perfect before you can succeed? Will you communicate to our daughters that unless they have unshakable confidence they can’t go after their dreams? Uh, no. So move forward, honey. 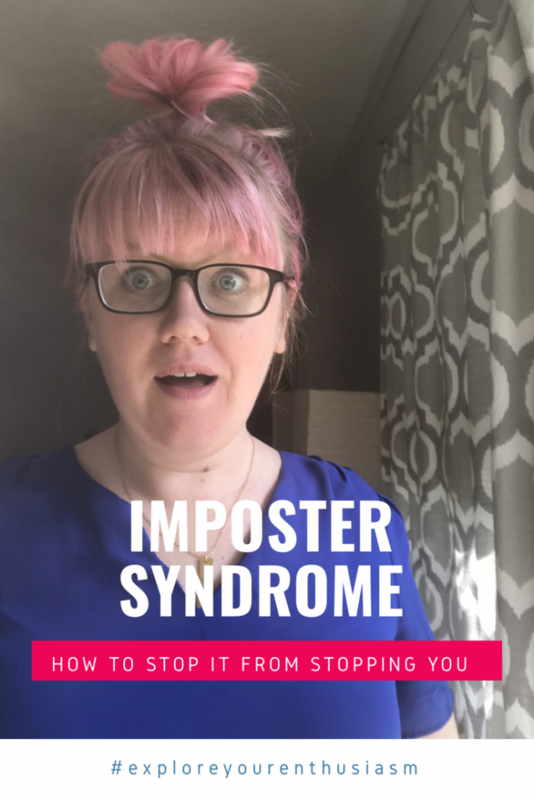 I hope these strategies help you overcome your Imposter Syndrome, but above all I want you to remember: You can feel like an imposter and do it anyway. You don’t have to get rid of it completely, but learn to be able to act even when you do feel it. This episode on imposter syndrome was exactly what I needed to hear today! Hoang, Queena (January 2013). “The Impostor Phenomenon: Overcoming Internalized Barriers and Recognizing Achievements”. The Vermont Connection. 34, Article 6. – via http://scholarworks.uvm.edu/tvc/vol34/iss1/6. Tara managed to read @hankgreen's book despite having a 3mo old (foster) baby! I'm VERY impressed! You can hear more about Body Positive Power on Take Care of Yourself, my book + self-care conversation podcast with Joeli! 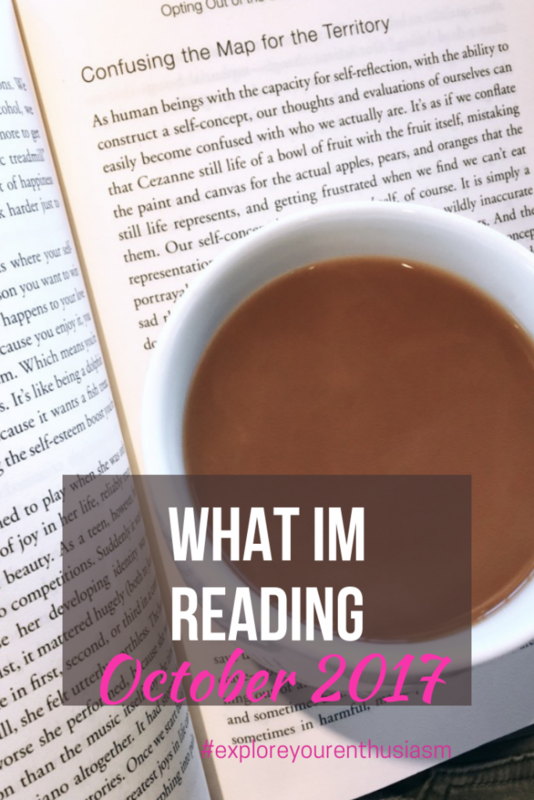 What I was reading in November in 2016, in 2015, in 2014 and 2013! Do you always seem to be coming down with some cold or bug? Do you feel exhausted all the time? When you sit down to work, do you find it difficult to focus and get distracted by Facebook and social media? Do you find yourself struggling to get motivated to send your newsletter or record that video? Well, stay tuned, because today we are going to talk about the one factor that might be the reason for all of those things. Today I want to touch on something I've been severely affected by and see affecting my friends on a pretty much daily basis: stress. 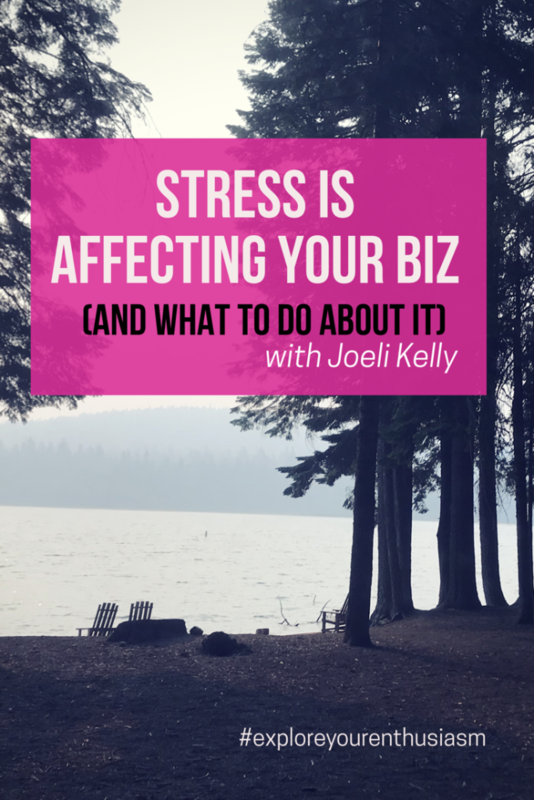 Firstly, let's define what stress is: Stress is an extra physiological demand on your body. It can be physical, environmental, or emotional and it can be painful or pleasurable. Basically, stress is anything that disrupts our current state of being. Next, we need to talk about our nervous system. The parasympathetic nervous system maintains normal functions when we are not under stress. It keeps the heart rate at a reasonable pace, supports healthy digestion and relaxes our muscles. But when we are under stress, the sympathetic nervous system kicks in and starts responding to that stress so that we stay alive. One of the ways the body reacts to stress is by releasing stress hormones. When we experience a stressor, the adrenal glands get a message to release noradrenaline, adrenaline, and/or cortisol depending on the situation and the perceived threat. When the stress is gone, everything is supposed to go back to normal. These hormones affect more than the areas we might think they do. For example, we all have probably experienced a moment of stress that sent our heart rate soaring, made our breathing get shallow, and our palms get sweaty. But there are other effects that are less obvious. The hormone cortisol regulates the metabolism of proteins, fats and carbs. It gets released because in times of stress the body wants us to start using up the fastest available energy first. So cortisol instructs our bodies to release a flood of glucose and then it also inhibits insulin production, so the glucose is used and not stored. This is good if the stress is short-term like during a workout, but pretty bad if we are experiencing chronic stress. What are some examples of chronic stress? Not sleeping enough. Not eating a nutritious diet. Being in a job with a lot of pressure or high demands (even if these high demands only come from ourselves). Going through times of uncertainty or significant change or very emotional times like grief and loss. Dealing with worry about money and finances. Long-term stress (either chronic or too many periods of acute stress like overexercising) starts to affect our physical well being. It can cause headaches & muscle pain, and fatigue. Stress affects the absorption of nutrients, raises levels of stomach acid (causing heartburn and stomach upset), and can cause inflammation in the intestines – there is a significant link between IBS and stress. It can also cause sleep problems and a lowered immune system. So if you're getting sick all the time, you're most likely under too much stress. It also affects our mood due to its effect on other hormones in our body which causes us to feel anxiety, unmotivated, unfocused, overwhelmed, irritable, and depressed. I don't want to get into too many details here, but you can research further how stress affects serotonin levels for example (which it's been shown that low levels lead to anger control issues, depression, migraines and IBS.) The main point is that stress affects our body physically by raising certain hormone levels and affects our emotional well being by lowering the levels of other hormones, and long-term this can be very damaging. Now stress is normal, and in the short term can even be good (for example our muscles grow and get stronger by first being stressed through exercise), and we are never going to eliminate all stress. That's absolutely not the goal. The goal is to balance things out. We all know that after we exercise we should stretch and rest. The same is true for other areas of our life. If we have a stressful job, then we need to balance that out with something that brings the scale back to the center. There is a chemical our brain makes called GABA which is an inhibitor – basically, it lowers the activity of other cells, particularly those that cause anxiety – which in turn helps us relax and balances our mood. If we don't have enough of it, it leads to anxiety disorders. (Many drugs that are anti-depressants work by interacting with GABA and its receptors.) One of the things we can do to balance periods of stress is to get our body producing more of this chemical and others, like serotonin that we mentioned earlier. There are many ways to achieve this balance, but I'm going to touch on six that I think are easy enough for everyone to do. The first way is exercise. Yes, too much exercise actually raises our stress levels, but you should be moving your body in some way every day. Exercise releases serotonin and dopamine and helps burn off some of the excess energy that our body creates as a response to stress. Doing gentle exercise like walking and yoga is an excellent option if you don't want to do anything too strenuous. The next way is getting enough sleep. You need a minimum of 7 hours, with 8-9 being the ideal. The importance of getting good quality, restful sleep really can't be emphasized enough. It's a time for our body to rest and reset. Third, diet and hydration. I know this is a bit boring. But poor nutrition and dehydration add stress to the body. So drink water, eat your fruit and veg, get your B12, Vitamin D, Omegas and maybe add a probiotic if gut health is a concern. Of course, a doctor or qualified nutritionist should be consulted if you need specific advice in this area. Fourth, meditation. Meditation has been shown to increase levels of GABA and reduce levels of cortisol and noradrenaline. Studies show that 20 minutes a day is ideal, but honestly, 5-10 minutes is going to do you wonders. Even one minute of focused breathing can help calm down our stress responses. Fifth, connecting with friends. A lot of times when our anxiety is high, or our mood is really low we withdraw from our friends and social situations. This is actually really counterproductive. Studies have shown that when we spend time with friends our cortisol levels go down and endorphins are released. Basically spending time with friends, having fun, and talking about our problems is vital for balancing out our stress. Now we can carry on for months and months in our high-stress lives, and not think of anything of it until something happens which forces us to rest. When that illness or burnout hits, we might turn to things like mediation and healthy eating to help us get back on track. But then when we start feeling better, our healthy habits start to slip away again, and we go back to the grind. Please don't do this. Please don't wait for things in your life to slow down before you rest, or say “well I just get through this launch and then I'll rest.” Because you know and I know, that you most likely won't rest. You'll find something else to throw yourself into. And meanwhile, the stress builds and builds in your body. Start getting yourself back in balance today. Now, we all are aware that knowing what to do and actually doing it are two different things. then you might want to work with a coach. You can google “wellness life coach” to find people trained in this area, or you can get in touch with me! I've been helping women create lives they love for the past few years, and nothing would make me happier than to see all women reduce a bit of the stress in their lives. (After all, we can't smash the patriarchy if we're all burnt out!) I offer a free 20-minute introductory chat so we can talk more — you can email me hello@joelicreates.com or find me on Instagram (I'm @joelicreates there) if you would like to chat more. And be sure to let me know you heard me on Tara's podcast! Such an important thing to talk about! We can't be in balance if we're constantly stressed! Are you getting distracted by what other people are doing? By what you *should* be doing? Today let's go beyond the Comparison Trap and instead look even deeper at how to play your OWN game. I think we all know a lot about how easy it is to fall into comparison, but I wanna challenge you today to go deeper. The question isn't just “am I comparing myself to others?” but “am I even playing the game I want to play? I hear this from the makers I work with, all the time. You see, when you look at what other people are doing and compete on their grounds, you're playing their game. Instead, play your OWN game. You set your own rules of what success is. You decide how to move towards that goal. You decide what “counts” and what doesn't. You decide what to measure and what to ignore. Get as awesome as possible at what YOU love, not at what other people have success with. It will be WAY easier to go to work every day, and it will free you up to create something totally new. This is one of the keys to standing out in your industry – do something that you most care about, in the way you really want to, no matter what is bringing other people success. I want to challenge that. For starters, your people, the people you're serving and providing awesomeness for, they are LONGING for what you alone can offer. If you give them something no one else is doing, they are going to LOVE you. Adore you. Buy everything you make. When you step up to being the best at your OWN game, there are going to be customers who love it. Will everyone love it? Nope! But “everyone” doesn't love what you're doing now! Your job is not to create something everyone likes. Your industry, your “competitors”, the people in your life who don't get it … they might not like it. They might not get it. They might think it's super strange, fringe, or inexplicable. But that doesn't mean they don't like YOU. Beyond that, it doesn't matter. Your business is not counting on everyone approving of it. It IS relying on some people to be so passionately enthusiastic about it that they can't wait to buy. And that's only going to happen when you start offering something YOU are enthusiastic about, that shines out something only you could do. So please, don't be troubled by anyone else. Play your own game. 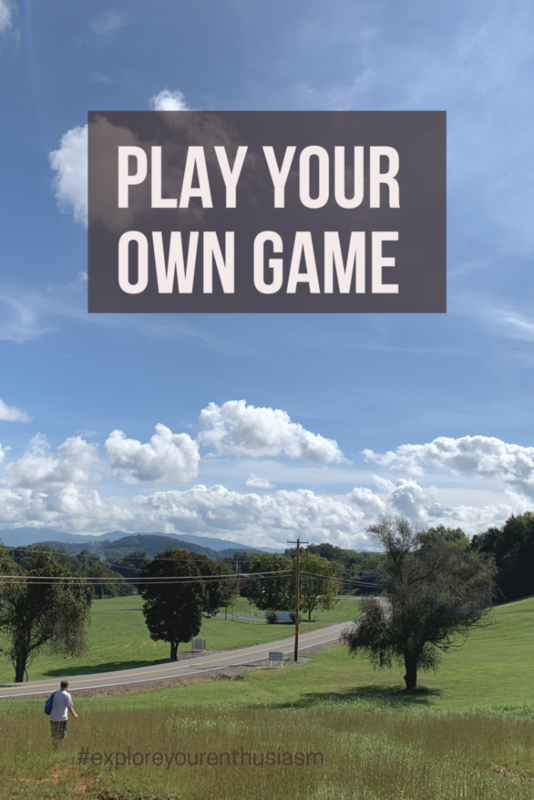 What is your own game? I don't know! But here are some things to ask to yourself: Am I doing this because everyone else is? Or because this is what I want to be great at? What do you think? What's the game you are playing? P.S. The game I'm playing: providing you with enthusiasm and encouragement to become the best expert in your own business and life. If you know someone who needs to hear this, share it with them. So excited to start playing and focusing on my own biz game! Whether for planned or unplanned circumstances, it’s easy to feel like taking time away from your business is committing career suicide. Totally not true! In fact, taking leave from your business can provide an opportunity for valuable revitalization of your business trajectory and your life! In this episode, we’ll cover the basics of a plan for taking a leave from your business. So whether you’re adding a new member to your family, taking time out to care for a family member, have a medical emergency or are taking a well-earned sabbatical to dream big, this episode is for you. A typical leave can be characterized in three phases: a complete leave (where you don’t lay a finger on a business-related task), a ‘maintenance mode’ (where work for a very limited number of hours, focusing on only the most essential tasks) and a ‘rev up’ phase (where you slowly transition to ‘life as usual’). The more that you can plan in advance for an efficient maintenance mode, the more successful you’ll be! You may identify a financial goal (to make X amount per month during your leave) or a business-related goal (i.e. to maintain your current customer base) for your leave. You will probably not experience growth during your leave time, but you’ll be focused on making the most happen in your available work hours. If you are entering a planned leave, then you have the luxury of time (not so for an unplanned leave caused by an unforeseen emergency). The easiest strategy for keeping content consistent during a period of leave is to ‘work ahead’ before your leave begins. A leave may be a time when you want to consider hiring help to take on tasks that you won’t have the time to complete. It is best to document your business procedures and search in advance of your leave to find the right fit. Hiring someone from a hospital bed is probably not the best timing! I encourage you to look at your whole life when planning. Maybe during your leave period, you decide to hire out the cooking of meals to leave more time to dedicate to your business. That’s totally legitimate! You’ll be able to make these types of decisions once you’ve completed documenting how you spend your time and setting your priorities (goals). By the end of this episode (even if you’re not taking leave), you’ll feel ready to streamline your business and focus on the essentials! 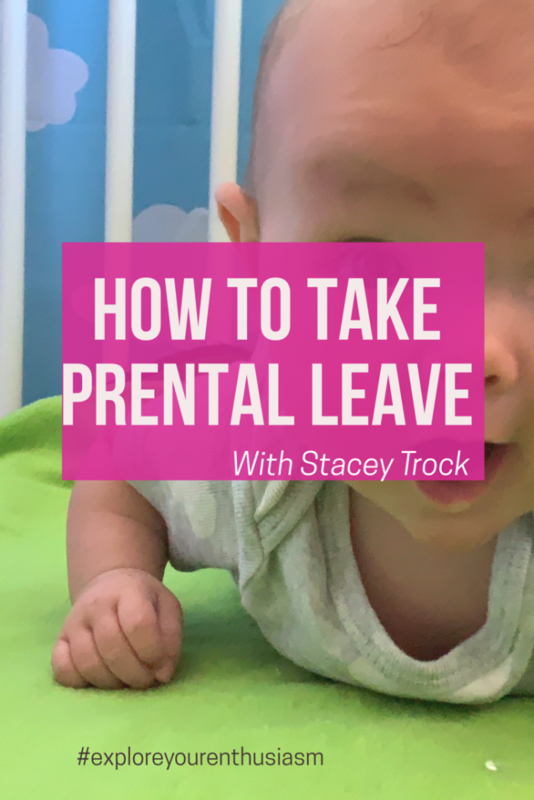 Such a great guest ep from @stacey_trock about taking parental leave from your biz! You can hear more about Recovery and Simplicity parenting on my book + self-care podcast! 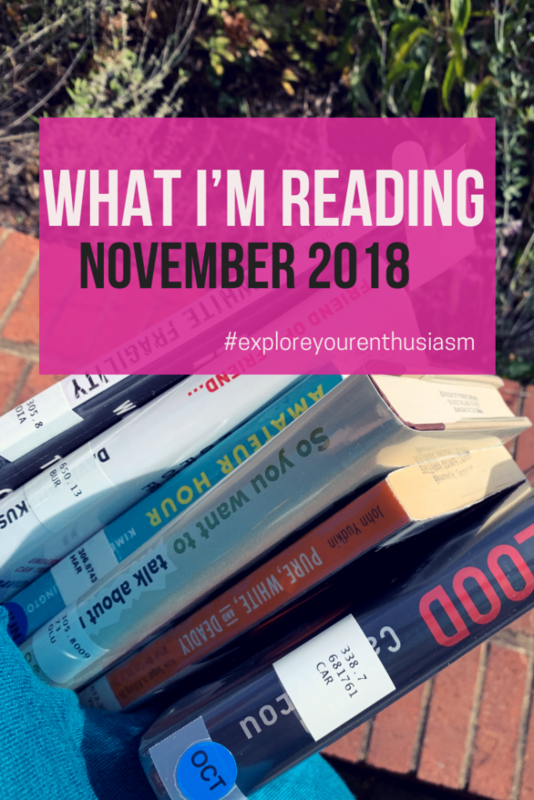 What I was reading in October in 2016, in 2015, in 2014! I'm always on the look out for new books to read, and these were great options! I did not want to talk about this. I have been avoiding this topic for years, even though it's something my listeners and clients ask all the time: WHY do I keep sabotaging myself? If you feel like you sabotage your own success, today’s episode is for you. So last week I put up 5 different podcast ideas for the Starship to vote on what they most wanted me to talk about…and you know what got the most votes? Self Sabotage! Even though I've been asked this a lot, I've avoided talking about it because…I think it's possible you are NOT sabotaging yourself. Sometimes the things that look like self-sabotage are actually just you taking care of yourself! For example, if you wake up with a headache, like I did last Friday, and you decide NOT to work on your To Do list, even though it's very big and you have a deadline…is that self-sabotage? Or self-care? Now, since we're talking about ME, I bet you'd say: Tara! You have a headache, take the day off, your business will be OK! But if we are talking about YOU, you'd say: Oh, I really should have worked, I have things I know I am supposed to do! I totally sabotaged my list by not working! And girl, that's just wrong. So before we talk about REAL self-sabotage, we gotta get clear that every time you don't work, every time you take a break, every time you decide NOT to show up for something, it's not necessarily ruining everything – sometimes it is you taking care of yourself, or giving yourself what you need. When I get an opportunity, but believe I can’t do it, so I don’t follow through. When I’m scared. 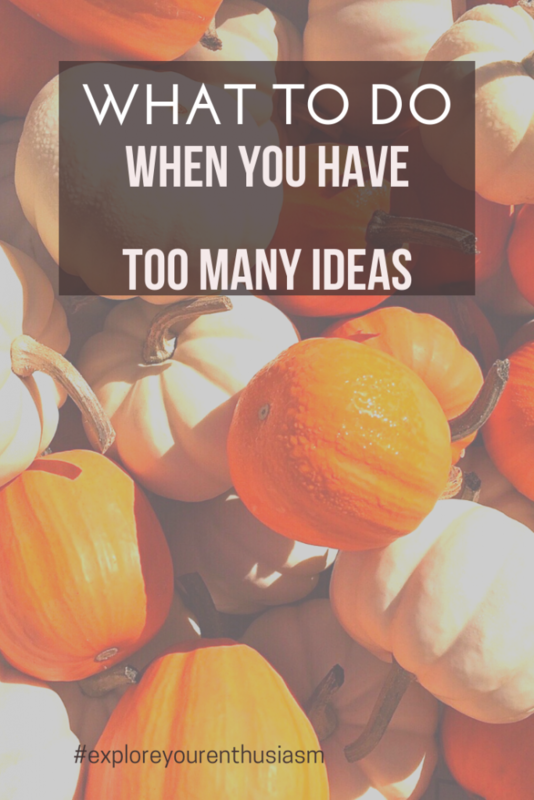 I plan a big thing, and then don’t follow through (like a big launch, where then I only send a couple emails instead of doing everything I had planned). You actually don't want what you're working towards. You'll notice that each of these reasons is actually…self-care! You're protecting yourself from what you think you can't handle or don't want. 1. Get really specific about what the self-sabotaging activity is and why you did it. Girl, that is a belief you have about yourself. It's a belief, not because it's true, but because you keep saying it to yourself. As long as you keep repeating this and believing it, you're never going to be able to move forward. Until you can believe the opposite (“I show up for what matters. I can do what it takes”), replace it with the truth, “I'm not sure what's up, but I'm doing my best. I'm protecting myself.” Move towards trusting yourself to show up by getting clear on exactly what you do and when you do it. Get clear on why you're doing it (what you're protecting yourself from). 2. Let go of the fear. What is the much more likely (smaller) thing that may happen? This is the time to use all the tools you have to release fears – therapy, journaling, essential oils, tapping – whatever works for you! 3. Notice all the ways you DO show up for yourself. Do you buy groceries and cook meals? Do you spend some time crafting? Or doing anything you love? THAT is showing up for yourself. YOU ARE DOING IT. And it's transferrable! If you show up in this way you can show up in others. 4. Show up for yourself, even more. And make note of it when you do. Self-sabotage isn’t something to beat yourself up about. It’s something to take care of yourself in the face of. 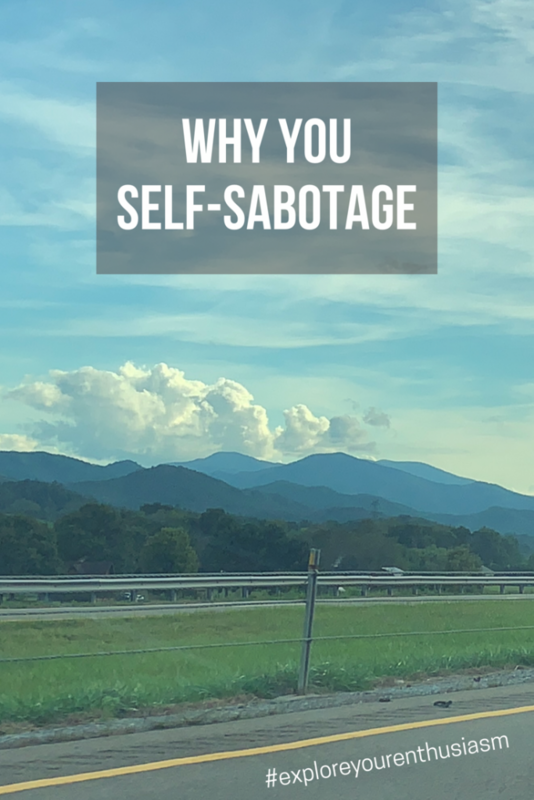 Love this view of self-sabotage as a signal to take care of yourself!